I had to at least point the ol' man in the right direction, so I decided to ask him for a 7 " pan and a set of 4 cute little ones (4 1/2 " by 1 1/2 ") that I'd found in Raw Freedom Community's Amazon Store. For the first dessert of the year, I just had to make something special. I chose to inaugurate my new 7" springform pan in style with a decadent and gorgeous cake inspired by Vanessa Sherwood's fantastic White Chocolate-Strawberry Cheesecake. Process first 7 ingredients in a food processor until fine. Add agave and process some more until the mixture just starts to stick together. Press into the bottom of the springform pan. Blend all ingredients in a high speed blender until completely smooth. Pour the filling over the crust and chill or freeze until ready to serve. 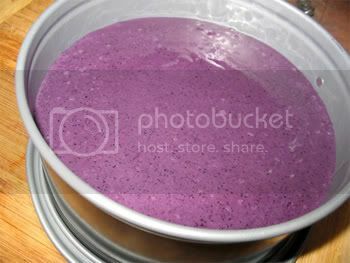 Carmella's Note: If using frozen blueberries, make sure they are well thawed and at room temperature to avoid the honey turning rock hard during blending. If desired, decorate with chocolate sauce (just mix 1 part melted coconut oil with 1 part agave or maple syrup and 1 part cacao powder) and blueberries. ~ To de-mold your cake, gently pass a knife along the edge of the springform pan before releasing the buckle. ~ Wash the pan immediately after use and don't let it sit in water to avoid the hinges rusting. Looks supreme! Yummy, makes me very hungry! I really enjoy your blog, keep it up. Thanks for all the work you do on it. oooh, this "cheesecake" sounds divine - I'm getting into raw "baking" and "cooking," so seeing such a scrumptious-looking treat like that one is fabulous!! and happy belated anniversary for your blog!! how exciting!! It is soooooo simple to make too. You'll have to give this one a try for sure. In fact, we're just about to munch on the left-overs. Yippee! On another note, I am severely allergic to nuts, and was wondering if I could substitue them with some seeds? Or would this not work? do the nuts in the crust have to be soaked or no? this looks great! can't wait to try it. Hum, I've never tried using seeds for crusts so can't really say. Perhaps sunflower seeds would work? The nuts are used dry. What I like to do when I have extra room in the D is soak nuts overnight and dehydrate them. That way they're all ready to be used in a recipe and I get to enjoy the benefits from the soaking (alkaline and more easily digestible). 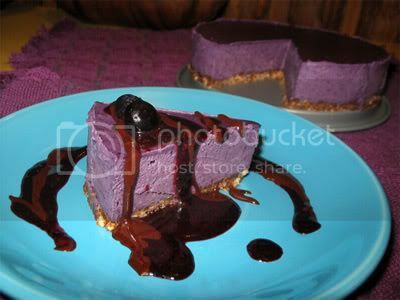 Lovie, this cheesecake looks divine - I esp love the colour!I want some! Topped w gooey choccie sauce too! Yummy!!! I can't wait to try this. I LOVE cheesecake and this looks absoluely wonderful. 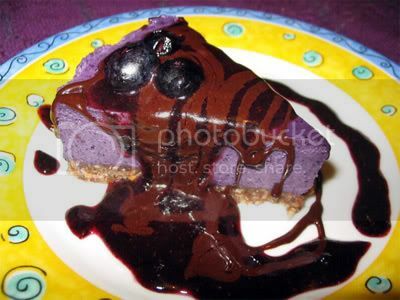 I just made this with blackberry instead of blueberry. So delicious! And pretty easy. I was at the store and they didn't have a 7" springform but the 9" worked fine, just thinner. I made this recipe a few weeks ago and it was absolutely delicious! My un-raw friends and family even enjoyed it - thank you so much for sharing! Would you be apple to substitute all coconut oil for the butters? You mean use only cacao butter? Sure, you could. I'd recommend using less of it, though, as cacao butter is firmer at room temp than coconut oil. Coconut butter would also work well. What a treasure of a recipe! Thank you so much for sharing. You’re pictures are outrageous. It’s one thing to read a recipe, but no words can stand against those pictures you present. Well done. I also used a vita-mix rather than a food processor. Process Flax seed and cacao nibs until fine, doesn’t take very long. Add Almonds, shredded coconut, salt, dates and give it a whirl. You want to break down the dates and mix things up, but not let it get to sticky. Last, add the macadamia nuts, agave and vanilla. With the last spin, you just want to break up the nuts into little white chunks. Tried this recipe last night - delicious! This was my first attempt at a raw dessert and my whole family loved it. I did, however, use maple syrup in place of agave nectar... I suppose that's not legal - I'll have to do better next time. Also, I used only coconut oil, and hazelnuts in place of almonds and walnuts in the place of brazils. I didn't have the right type of pan either, so I used a glass pie pan. Although I didn't follow the recipe exactly, as I didn't have all the right stuff here at home, it turned out fabulous and it was so easy. Thanks! 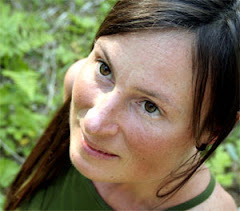 I feel honored that you were initiated to the amazing world of raw desserts with one of my recipes! Woo hoo! 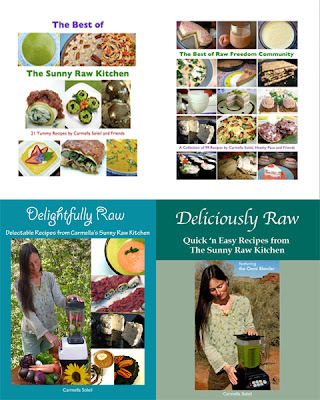 One of the wonderful things about raw foods is that you can easily modify recipes to suit your taste buds and what you have on hand. I CA NOT WAIT TO MAKE THIS RECIPE!! i finished making the coconut milk and not its slowly turning into butter! so tomorrow when i get home from school im going to make everything else! i just cant wait to try this cake! Quick question! Should it be 1 cup of *whole* cashews that are then ground up before putting in the filling? Or is it 1 cup of already-ground cashews? It's all in the position of the comma! ;-) In this case: "1 cup dry cashews, finely ground" which means that the measurement is taken before being ground up.